Cataract surgery is the most common procedure performed in the UK and has a high success rate. However, the idea of undergoing eye surgery may still seem scary to a lot of us and so consultant ophthalmologist, Professor Sunil Shah, and Medstars’ Will Chadbon are on hand to explain everything you need to know about cataract surgery. A cataract is the clouding of the lens of your eye. Your lens is the shape and size of a smartie and sits behind the iris to help focus light into your eye. Usually, we’re born with perfectly clear lenses but, like many things, they can deteriorate with age. As we get older our lenses fog up, like bathroom glass, which impairs our vision. Initially, the misting of your lens may be subtle, but over time the problem can worsen to significant loss of sight, or even blindness. You may find that you’re coping well with early cataracts, but the problem gets worse as time goes by and the impairment to your vision cannot be fixed by wearing glasses, or through medications such as eye drops. Therefore, it’s advisable not to wait for the cataracts to ‘ripen’ before considering surgery. If you’re experiencing hindrances to your day to day life, then surgery can be a good option. Eye test results can give an indication of the severity of your cataracts, but it’s up to you whether or not to go ahead with surgery. 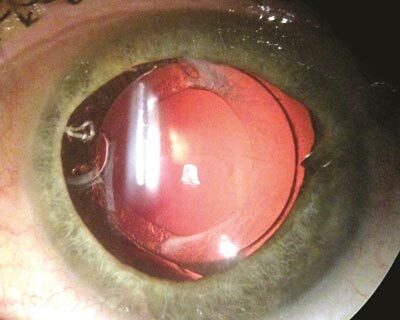 Traumatic cataract and iridodialysis after a paintball injury. Before surgery, you’ll meet with a specialist eye doctor for a pre-assessment appointment. During this assessment you’ll undergo a series of eye measurements. The measurements will observe the shape of the front of your eye and the length of your eye. These measurements, combined with some eyesight tests, will help the ophthalmologist or optometrist decide which specific lens is needed for your eye. Throughout this assessment, you can discuss any questions you have about the procedure. Cataract surgery is carried out in a hospital operation theatre and usually takes between 30 to 45 minutes. Medstars’ consultant ophthalmologist, Professor Sunil Shah, explains, “Before the surgery, you’ll be given the choice to have a local anaesthetic in the form of eye drops, an anaesthetic injection behind the eye to numb it, or a general anaesthetic to fall asleep. If you’re nervous about the procedure, your surgeon may offer you sedation or a Valium tablet to help with anxiety.” The anaesthetic will do its job during the operation but shouldn’t stop you from going home on the same day. Once the anaesthetic takes effect, your surgeon will make tiny cuts to the surface of your eye or eyes (you can have both eyes done on the same day). You won’t feel any pain, or see much detail, but may feel some pressure. The cloudy lens will then be broken into tiny pieces using a high-frequency ultrasound device. 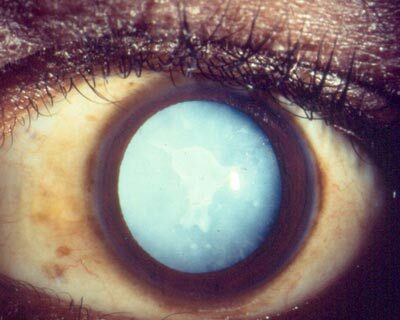 The remnants of the lens are then gently removed from the eye using suction. Your surgeon will proceed to delicately place a new, clear lens onto your eye. The surgery rarely involves any stitching to your eye and is usually left by your surgeon to heal naturally. 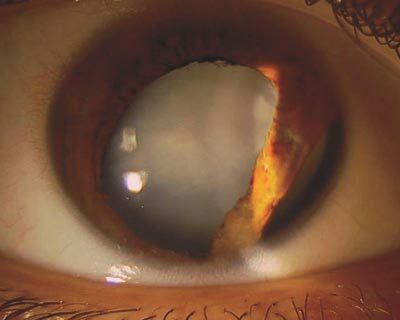 One-year post-operative photo of left eye following cataract surgery. A glaucoma valve can also be seen. The patient had sustained significant blunt trauma to the eye in the past. Cataract surgery can give multiple benefits that will improve your daily life. You should experience a sharper focus on the things around you, less glare from bright lights, and clearer distinguishability between colours. However, before these improvements become apparent, your eye will need some time to recover. Full recovery can take between 4 to 6 weeks. Your eye doctor may prescribe you with eye drops to be used several times a day during this time. You may also be given a special pair of sunglasses to protect your eye from strong lights, and a protective shield to wear while you sleep. You may find that some redness of the eye, or blurred vision, persists a few days after surgery. This is not uncommon, so don’t panic. Be cautious of strenuous activities and exercises, as well as exposure to water or other substances that may get into your eye as it heals (make sure you shower and bathe with your eye closed). There is also a chance that you may still need reading glasses after cataract surgery – regardless of which lens you choose. Though some lenses cater well for seeing things up-close, many people find that reading glasses are helpful for some tasks such as reading very small print. What risks does the surgery carry? Problems are very rare, with a roughly a 1 in 1,000 chance of permanent damage as a direct result of the operation. However, it’s very unlikely that any damage will be caused to your eye. Any problems that may arise can usually be treated with medicines or additional surgery. 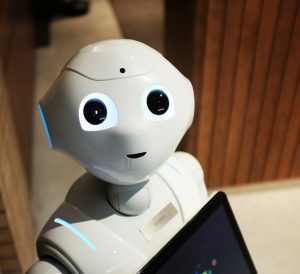 Developments in technology can make surgery safer, use less energy in the eye and improve outcomes. The implants (or intraocular lenses) used have undergone dramatic changes. Traditionally one uses a football shaped single vision implant. So if you have astigmatism, the astigmatism isnt corrected. However, you can put in a rugby balled shaped astigmatism correcting implant that can dramatically improve vision. This blog has been co-created by consultant ophthalmologist, Professor Sunil Shah, and Medstars’ Will Chadbon. You can book a consultation with Prof Sunil Shah, who has specific expertise in cataract surgery, laser eye surgery, corneal transplants, refractive surgery and clear (refractive) lens exchange, here.